Girl Town is a collection of five stories in graphic format. The cover illustration is of Betsy from the first story, "Girl Town." It's about three young woman who live next door to three other woman who they find kind of terrifying but also compelling. In "Radishes," a girl convinces her friend to skip school and go to a very strange market where they sample some produce that has surprising effects. "Diana's Electric Tongue" is about a woman who buys herself a robot boyfriend. "The Big Burning House" is about a cult movie that has been lost and nobody can quite remember all the details, and two women who have a podcast about it have suddenly obtained a copy of it that will answer all their questions. In "Please Sleep Over" a young woman invites her friend to stay at a house that apparently belongs to her parents and honestly I am not quite sure what is going on. The two women arrive wearing some sort of medals around their necks that aren't ever explained, a stranger comes into the house talking like she knows them, and the ending doesn't make sense to me. Anyhow, my favorite was "Diana's Electric Tongue" although I really liked "Radishes" quite a lot too. I could see myself going back to read those again. Speaking of stories where I don't really know what was going on, this never-before-published short story by Sylvia Plath was pretty weird. She submitted it to a magazine when she was in college and it was rejected, and it was just published for the first time in a standalone volume. This seems to be a thing now - publishing a short story all by itself - and I'm not sure what I think of it. At any rate, I wasn't about to pass up something by Sylvia Plath. 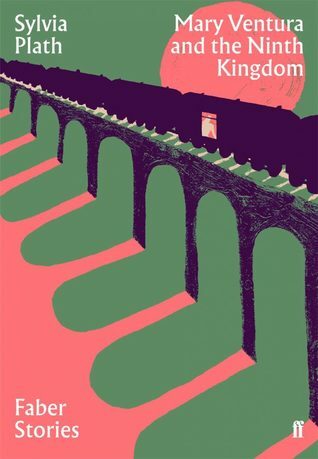 In this story, Mary reluctantly leaves her parents on a train where she is going to a place called The Ninth Kingdom. What is the Ninth Kingdom and why is she going there? Who the hell knows. Well, one lady knows, I think, and she's sitting next to Mary on the train. She's friendly and knows more than she's really letting on, but she won't actually tell Mary (or us) anything. I don't know if Mary's parents sent her away or if she's ever expected to come back or what explanation she has for her journey. Her parents make a reference to "time to leave home" so it doesn't sound ominous. But the woman on the train makes the trip often and seems to have some sort of business interest in it. When Mary talks about how luxurious the trip is, the woman says you pay for it in the end. "The train company has more than a pure friendly interest in the passengers." And then they came to a stop and a woman whose ticket was for that stop had to be forced off, which implies that the passengers don't like where they're going. I think the whole thing might be an allegory about becoming an adult and choosing your path in life. The woman on the train says the passengers bought their tickets and chose their destinations and they can't now decide to get off elsewhere. Mary is destined for the final stop, and the older woman describes the Ninth Kingdom as "the kingdom of negation, of the frozen will." But there is one way that Mary can escape her fate, which makes it all a little bit less ominous. I read the story twice, and although it still doesn't 100% make sense to me, I feel pretty confident about my interpretation.